Based on KYOCERA Document Solutions’ many years of expertise in unique long-life technology for printers, under the basic philosophy of “Continuing to develop and produce remarkable environmentally conscious products true to the name of the printer brand ‘ECOSYS’ all through the ages,” KYOCERA Document Solutions is developing environmentally conscious products and technologies in various aspects. By reducing consumable items by long-life design developed under the ECOSYS concept and conducting energy-saving efforts, we have achieved a remarkable reduction in TEC* values and CO2 emissions, compared to conventional models. * TEC value is a criterion required to comply with the International Energy Star Program standard. It refers to electricity consumed in one week, assuming (alternation of operation and sleep/off modes five days) + (sleep/off modes two days). With KYOCERA ECOSYS devices offer a wide range of enhancements designed to maximise document output productivity. Additional functionalities and upgrades are available, optimising the long-term benefit of investment. Finally, KYOCERA Document Solutions’ integrated system software ensures long-term and cross-network compatibility. 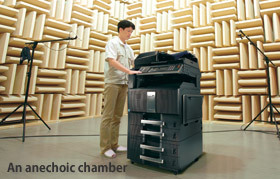 Following numerous discussions, every KYOCERA Document Solutions employee is constantly pursuing “what the customer wants most” as well as “quality that warrants customer satisfaction.” Reducing a product’s operational noise even by a single decibel (dB) requires an incredibal amound of effort. In particular, in the case of multifunctionl product that are often used beside one’s desk, the realizeation of a non -disruptive level of operation nooise was a major issue. In making these improvements, we were able to achieve levels five decibels (dB) quieter than when compared to prior machines. 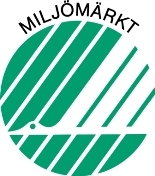 Nordic Swan is an environmental label for which shared criteria are stipulated by the Nordic Eco-Labeling Board and which is used in Sweden, Norway, Finland, Iceland, and Denmark. It is operated by the relevant ministries and agencies of these countries. The “Swan” is the official Nordic eco label, introduced by the Nordic Council of Ministers. The Swan logo demonstrates that a product is a good environmental choice. The Swan checks that products fulfil certain criteria using methods such as samples from independent laboratories, certificates and control visits. The Swan’s requirements are: attention to the product’s impact on the environment from the raw material to waste throughout the product’s lifecycle; and standards with regards to quality and performance. Many of KYOCERA Document Solutions’ devices comply with the Swan. For more details about awarded products please go to the award site. The Blue Angel eco-label is one of the most famous environmental labels in the world. Awarded by the German Institute for Quality Assurance and Certification, the label signifies that a product has exceptional ecological credentials and meets the detailed criteria of a comprehensive body of legislation set by the Federal Office for the Environment. 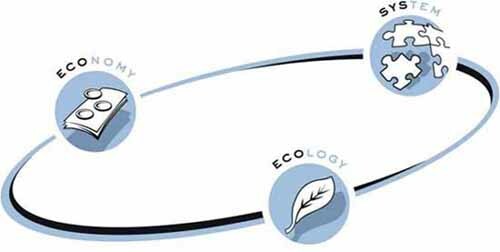 The objective of the “Blue Angel” eco label is to keep the impact of harmful substances, energy consumption and waste on the environment to a minimum. The award of the “Blue Angel” eco-label has a long-standing tradition at KYOCERA Document Solutions. 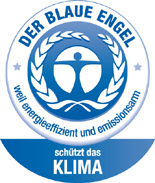 Blue Angel is an environmental label whose criteria are stipulated by the Germany Federal Environment Agency (UBA) and which is operated by the German Institute for Quality Assurance and Certification (RAL). For more details about awarded products please go to the award site. The new ENERGY STAR specification for imaging equipment introduced by the Government of the US and the EU helps users of office and home technology to protect the environment and save money through energy efficient products labeled with its logo. The new ENERGY STAR rating for imaging equipment has stricter requirements than its predecessor, particularly with regards to paper consumption. 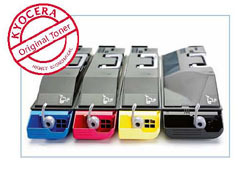 All of KYOCERA Document Solutions’ current printers and multifunctional products produced after 1 April 2007 fulfil and exceed the requirements of the new ENERGY STAR specification. ENERGY STAR rated printers can cut electricity use by over 60 per cent and an ENERGY STAR rated MFP can save about 160 EUR in electricity bills over its lifetime in comparison to non-rated devices. For more details about awarded products please go to the award site. through delivering our products to our customers. We contribute to environmental protection not only through its products, but also by ensuring that its manufacturing facilities and methods are environmentally friendly throughout all development, production and distribution processes. This often involves aggressive measures, such as installing solar power generating systems on facility rooftops. truck to its warehouses after discharging them at the Port of Rotterdam in the Netherlands. Since its new warehouse began its operation in 2007 (in Beringe, southern Netherlands), its mode of transportation has been shifted to trains and/or barges*, which are considered to cause less strain on the environment, reducing its truck transportation accordingly. The proportions of its modes of transportation in fiscal 2009 were: 84% for trains, 7% for barges, and 9% for trucks. Recognizing the technology of the ECOSYS printer and our efforts towards resolving environmental issues, KYOCERA Document Solutions was elected the Environmental Company of the Year at the Microscope Awards for Channel Excellence (ACE). In addition to our efforts in regard to environmental issues, we were also deemed to have made achievements that set a good example to other companies; an evaluation that was connected to our receiving this award. The 21st century is becoming known as the “environmental century.” KYOCERA has known since its early days that business activities can influence the environment and human life. Thus, we as KYOCERA Document Solutions established a clear vision to seek harmonious balance between economic development and environmental protection. Our goal is to provide attractive products and services while taking active measures to prevent global warming, reduce waste, promote energy efficiency and conserve resources. Here are some global activites initiated by KYOCERA Document Solutions. KYOCERA UK has signed the 10:10 climate pledge and committed to reducing our carbon emissions by 10% in 2010. We’re publishing our progress towards achieving our 10% – if you’d like to see how we’re getting on click here. We are encouraging all of our customers and busness partners to join the campaign. Find out more about it atwww.1010uk.org. Green Card is the free environmental information network for customers and associates of KYOCERA Document Solutions UK. The aim of the network is to inform our customers about environmentally responsible office practices, relevant legislation and KYOCERA’s own environmental sustainability practices. 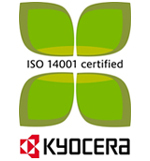 It is part of KYOCERA’s wider commitment to promoting environmentally responsible business. The principle of Reduce, Reuse, Recycle is central to the work of the Green Card network and drives every activity that is undertaken by KYOCERA. KYOCERA is committed to reducing the impact of its business operations on the environment. The aim is to continuously improve our environmental performance. In November 2008, KYOCERA Document Solutions became the first company in our industry sector to achieve The Carbon Trust Standard. This accreditation demonstrates our ongoing commitment to reducing the environmental impact of our operations, and recognises the significant contribution of all our staff towards exceeding our carbon abatement targets. In 2007, KYOCERA Document Solutions Germany along with the German Environmental Aid Association (DUH) and the Federal Association of Medium-size Enterprises (BVMW), established the KYOCERA Eco Award, which is designed to award small- and medium-sized businesses that have contributed to the development of new energy saving technologies and environmental protection projects. The objective of the joint initiative is to initiate projects among small and medium-sized businesses in Germany for reducing CO2 emissions. On April 29, 2009, the second award ceremony of the KYOCERA Eco Award was held in Bonn, Germany. This award has been conducted with a donation of 100 thousand euro in total from KYOCERA Document Solutions Germany, DUH and BVMW, with 50,000 Euro being awarded to the first prize winner, 30,000 Euro to the second prize winner and 20,000 Euro to the third prize winner. The screening this time was conducted by a panel of 10 judges with Prof. Klaus Topfer, then Executive Director of the United Nations Environment Programme (UNEP) and then German Federal Minister for the Environment as chairman, resulting in the selection of the following three companies out of over 60 nominees. On April 29, 2009, the second award ceremony of the KYOCERA Eco Award was held in Bonn, Germany. The company developed high performance sails for freighters. These sails save approximately 50% of the energy previously used during navigation. The company developed natural gas-powered small co-generation facilities in cooperation with the automobile manufacturer, Volkswagen AG. This system can not only reduce household CO2 emission but also network houses to provide extra electricity for local governments as required. This company developed machine knitting needles that are more lightweight than conventional needles. These needles reduce the electricity used to power knitting machines, as well as contributing to reducing lubricating oil with a change of the material. KYOCERA Document Solutions America received the Technologies and Commodities Category Award at the 2008 Evergreen Awards. Established in 1998, these awards are given to companies that are good models to other companies, in recognition of proactive engagement in enterprise activities designed to reduce waste and recycle in consideration of the environment. This is the second time KYOCERA Document Solutions has won this award, the first being in 2005. We also won the 2008 Industry Green Contractor of EIP Award (Excellence in Partnership Award) – the most competitive category – recognizes companies that provide products that are kind to the environment, and have contributed most to the environment in the areas of manufacturing process and business management. Activities in "Business Clean-up Australia"
In February 2009, “Business Clean Up Australia” (a business-oriented volunteer cleaning effort held yearly across Australia) was held. Twelve employees below the president participated as volunteers. Activities included the cleaning of weeds and removal of garbage at Chowder Bay National Park, and the planting of native Australian flora. This project has been in continual operation since April, 2008. One tree is planted for each multifunctional product or printer sold, and the customer is asked to become an investor to purchase a tree. Trees are donated to developing areas including West Cape Province and Gauteng Province. It is an excellent opportunity for local natives to learn the importance of protecting trees. The Tamaki Plant has promoted various energy saving activities. 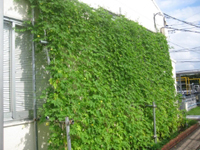 One of them, which was added as a new attempt in fiscal 2009, is the “Green Curtain Activity,” in which the outer walls of the plant are covered with leafy bitter-gourd vines. This activity was started by planting 25 roots of bitter-gourd at the south side of No. 1 plant? In July, the roots grew to form a beautiful 15 m-wide and 5 m-high green curtain. When the temperature of the outer wall was measured to examine its effectiveness, the average decrease in temperature turned out to be 4.1ºC. In fiscal 2010, the will extend the curtain to achieve a greater energy-saving effect. Our hope is to expand our “Green Curtain Activities” not only in the but also in our employees’ homes. For more, please click on the pic on the left. On March 20, 2010, KYOCERA Document Solutions Thailand carried out a volunteer clean-up campaign known as “Big Cleaning Day.” This activity was initiated from the rise of consciousness among employees about contributing to the protection of the global environment in the process of KYOCERA Document Solutions Thailand acquiring its ISO14001 certificate. The first campaign was conducted on June 3, 2006. In this campaign, the fifth Big Cleaning Day, approximately 50 employees participated in cleaning the beach of Khung Kraben Bay in Chantha-buri Province in eastern Thailand and collected litter filling 10 trash bags. KYOCERA Document Solutions Thailand has also planted mangroves as its social contribution activity helping to prevent global warming. In the future, KYOCERA Document Solutions Thailand will also be actively engaged in such environmental protection activities. Using original KYOCERA toner saves the staff health, device health and your money. Please read the brochure below which will give insight about positive effect original toner have. Print and photocopy documents double sided (duplex) which saves you time, space, money and costs and wastage. Duplex printing helps you save money on printing supplies by cutting your paper use by up to 50%. Please use the KYOCERA Duplex Calculator to find out how many trees you can save. Don’t overprint documents. Take care to calculate how many copies you really need to cut down on wastage. Use proof and hold to ensure a document is correct before printing a long print run. Ensure photocopiers, multifunctional products and printers are switched off when you are not using it or when you are leaving the office. Turn off the printer when you’re not using it and at the end of the working day. Use ECO Toner for draft documents to reduce the amound of toner used. It is recommended to analyse your needs prior to purchase and calculate the most cost efficient purchase which provides the minimum impact on the environment. Here you can also use the easy to use calculator KYOCERA Printer Economy Check (PEC) which helps you to find the correct device according to your requirements. Additionally, it also compares KYOCERA products to the competitors’ products and clearly shows your savings when you decide for KYOCERA products. Products with long-life components and higher toner yields will generate significantly less waste over the life of your product. Be informed, some printer process units take over 900 years to break down in landfill. If your supplier cannot provide this information find another supplier who can. 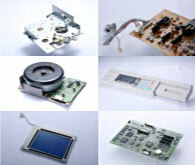 Ask your supplier if the printer, MFD or copier is compliant to the RoHS standard? If you can’t enable ENERGY STAR on your equipment, an alternative energy-saving software product called Energy Management Option, EMO, is available. This software can switch off your computer when you’re not using it and shut it down at night. It also provides calculations on energy, cost and greenhouse gas emissions savings which are useful details to include in your business’s energy audits and reports. Inkjet or modern dot matrix printers whilst they are generally cheaper to buy, are slower than laser printers and significantly more expensive to run, generating greater waste with low toner yields. It is recommended to analyse your needs prior to purchase and calculate the most cost efficient purchase which provides the minimum impact on the environment. If you are buying a printer, multifcuntional device, or copier ask your supplier about waste, takeback programs, what are the preventative maintenance cycles, how often do you have to replace a drum? Products with long-life components and higher toner yields will generate significantly less waste over the life of your product. 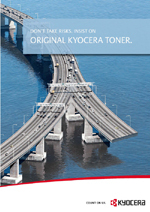 If you need toner, please make sure that you buy original KYOCERA toner. They save the environment, your money and the health of your staff and your devices. For more, please read the toner brochure on the right.